When I last saw Portugal. The Man March 19, 2010 at the small Highline Ballroom in Manhattan, they had just released their fifth album, American Ghetto, – an album dripping with electronic-Indie-pop influence – on an independent label. Back then, lead singer John Gourley seemed to have a case of stage fright, wearing a hat and hoodie and standing sideways to the audience, often turning his back on his viewers while unleashing guitar solos in the midst of the band’s lively jams. However Gourley’s stage fright never came across as a hindrance and the band’s show was captivating. Needless to say, I made sure to pick up tickets for their next New York City go-round, a June 3 show at a sold out Webster Hall (their biggest to date). Much has changed for Portugal. The Man in the last year. 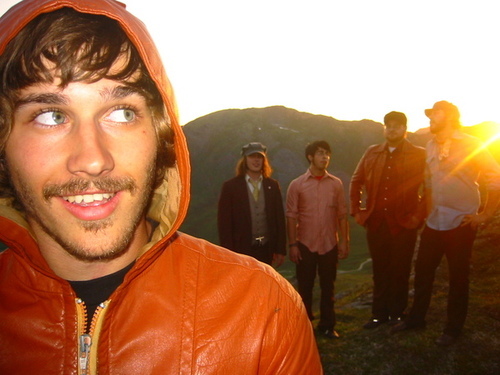 In April 2010 the Wasilla, Alaska band announced that they were bringing their act to Atlantic records. Recently they have been promoting their July release, In The Mountain, In The Cloud. However, one thing has stayed constant – the band’s live shows are still as passionate and strong as ever. Coming out in a heavy dose of fog and ambient red and blue lights, the band jumped right into a dark and bluesy intro jam that mixed “How the Leopard Got Its Spots” and “The Home” – two strikingly different numbers made four years apart – and showed how, when it comes to live shows, you can’t predict what you’ll hear next from Portugal. The Man. Lesser known songs such as the aptly named “New Orleans” and the hectic “Marching With Six” also saw the light of day and the band even threw in a cover of Etta James’ classic “I’d Rather Go Blind” that sounded as if it belonged in their set. One remarkable change in the band’s performance is that Gourley seems to have magically gotten over his stage fright. Gone are the days in which the audience would have to tilt their head and squint to get a glimpse of his whole face. Gourley traded in his hat and hoodie for a simple collared shirt and with nothing to hide behind, he faced the audience, singing and soloing with renewed vigor. Fittingly the final of the night was the band’s magnum opus, “And I.” A cathartic song off the band’s brilliant Censored Colors (2008), it is certainly Portugal’s most “epic” number. Coincidentally this was the band’s opener for that equally brilliant show that mid-March night in 2010. Fitting bookends for this period of rapid change for Portugal. The Man. ← Surfin’… New South Wales?